In a bid to restore health services in Palu, Central Sulawesi, Indonesia in the aftermath of the triple disaster — earthquake, tsunami, and liquefaction that hit the area — MSF built a temporary health facility in the Dolo Selatan Sub-District to replace the health centre of Baulase as the health centre that covering 12 villages had been heavily damaged and was unusable leaving the people without access to medical care. MSF, in coordination with the head of the Baluase health centre and the head of health care of Sigi District health agency, decided to construct a building comprising the out-patient department, maternity, and emergency as well as water and toilet facilities. In addition, MSF provided the backup system for electricity with a generator as well as a small waste zone with a burner. “After a discussion with the respective parties, we have agreed to build the health facilities next to the Dolo Selatan Sub-District office. The land is owned by the Sub-District administrator who supports MSF’s initiative for the good of the communities,” Yan Debry Dominico, MSF’s team leader said. In building the temporary health facility, MSF faced various challenges. MSF has the expertise in building structures to respond to emergencies. But, in this specific operation, the timing was very tight. The team needed to build the facility in ten days as there were patients who needed to be referred from the mobile clinic to an equipped clinic or hospital. The problem was that not all materials could be found in the village market, and most of the shops were still closed as the owners were leaving Palu after the disaster or the shop employees were still in the evacuation camps. “In my experience constructing health facilities with MSF in other countries such as South Sudan, Somalia, Ethiopia, and the Philippines, we usually tap into local contractors. This time in South Sulawesi, we found local carpenters and masons. Also, we purchased the materials locally even though some were quite difficult to find as the shops were still mostly closed,” explained M. Hasbi Ash Shiddiqi, MSF’s logistics/water and sanitation supervisor. In this particular situation, the response team has learned some good practices in building temporary facilities while maximising local resources. The process involved the people of the community and they were happy to be part of it. It has built a sense of ownership or belonging to the local people. After the construction of the health facilities was completed, the health centre was opened, and patients came in for health care services. “In the first three days, we had four in-patients, two emergency patients, and 20 out-patients. Even, we have two babies delivered in the health centre already,” Yan said with a smile. 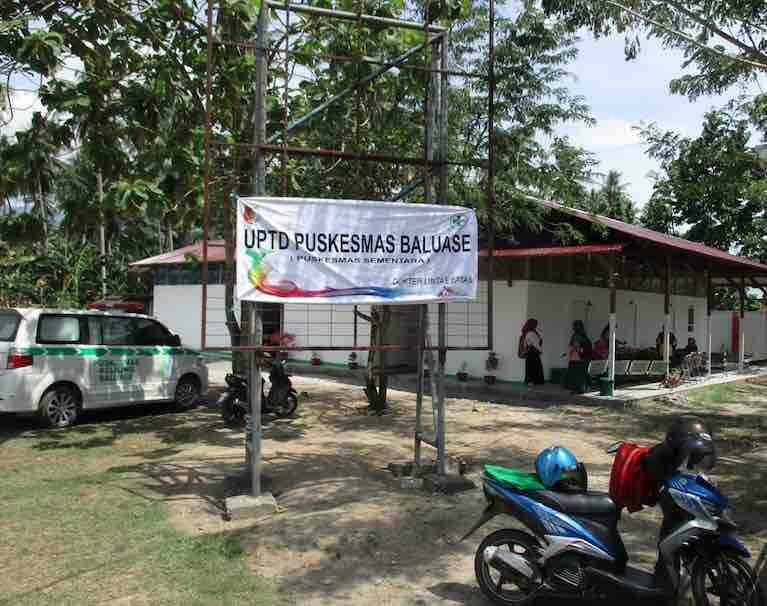 According to Hasbi, the communities in Baluase were happy to have the temporary health centre in their area so that they did not need to travel far to access health services, which was at least an hour’s drive if to another village or one and one and a half if to Palu City.